Description: Dicksonia antarctica is probably the best known of all the treeferns. Dicksonia antarctica can grow to 15 m in height, but more typically grow to about 4.5-5 m. The large, dark green, roughly-textured fronds spread in a canopy of 2-6 m in diameter. They can be cut down and, if they are kept moist, the top portions can be replanted and will form new roots. The fern grows at 3.5 to 5 cm per year and produces spores at the age of about 20 years. The plant can grow in acid, neutral and alkaline soils. It can grow in semi-shade. It strongly resents drought or dryness at the roots, but does best in moist soil. In winter protect the crown by wrapping it up with straw or dead fronds. Note: Dicksonia antarctica has many advantages over almost all the other tree fern species. It is nearly hardy in cool temperate climates. It is incredibly easy to grow. It is able to live through being shipped from Australia to Europe, which takes seven weeks in a container. Most remarkable of all, it can survive being saw off at ground level as a mature tree up to 6m (20 feet) in height. The severed plant has no roots apart from those an the trunk. When, in due course, the trunk in planted on the other side of the world, it produces new fronds in 4-6 weeks and with a year has rooted into its new growing medium. The survival rate is estimated to be 99% and the failures were down to mistakes by the growers. Gardening: Dicksonia antarctica is hardy to zone 8 and it will thrive outdoors only protected or it have to be kept in a conservatory all year round. This tree fern must be watered abundantly in hot weather during the growing period. They also need water from time to time, especially if the conservatory is heated. The outdoors specimens plunged in pots into the garden from spring to autumn and then moved inside into a protected environment for winter. 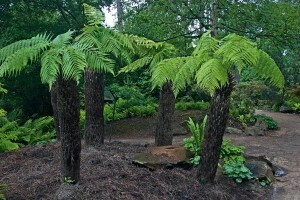 This is especially important for smaller tree ferns, around 60cm (2 feet) which are less hardy than taller, older ones. Also they are lighter and not too difficult to move around. Larger tree ferns can be left out over winter but need protection in zone 8 or colder. The ring of fronds at the top of the trunk forms a funnel that leads down into the trunk very nearly as low as the meristem (the bud tissue in the crown). This funnel will readily collect water. To prevent this from happening, stuff it with straw to about 15cm (6 inch) above the top of the trunk. This keeps the meristem warmer and excluded the worst of the winter wet, greatly reducing the risk of a block of ice forming in the crown. In mild winter this is sufficient protection for large plants of 1.2m (4 feet) or taller. For shorter, younger tree ferns in addition to the straw should be wrapped in insulating material around the top of the trunk. It can be used a belt of polystyrene plant trays, tied together and cushioned from the trunk with more straw – the straw is stuffed behind the trays and keep them secure. Tie a circular piece of polystyrene over the crown, which helps divert rainwater away from the meristem, offering protection against cold and keeping it dry. In severe weather, further layers of insulation, perhaps sacking or straw bales, can be tied around trunk. Other insulation materials could be garden fleece or bubble wrap. In places that rarely experience frost, protection such as this is less likely to be necessary. If the specimen is purchased as a log, soak the base of the trunk for a few minutes prior planting. If it is to be planted out in the garden, select a shady spot, protected by the wind; in less suitable conditions these tree fern tends to produce shorter fronds. Plant the log so that as little as possible is buried, while ensuring that it will not topple over – as these tree ferns are priced according to the length of the trunk.. Once the trunk is firmly in position, water it copiously all over and around the trunk. It is not recommended to fill the crown with water, especially if the weather is cold and damp as this practice could encourage rot. Keep the log watered daily if possible until the new leaves have emerged and expanded. A well watered tree fern produces larger fronds and generally will better set up for the next season. To grow a tree fern in a pot, plant the log as shallowly as possible. Water copiously and within six months the log should rooted and become secure. Use a pot as small as possible for the log at first. 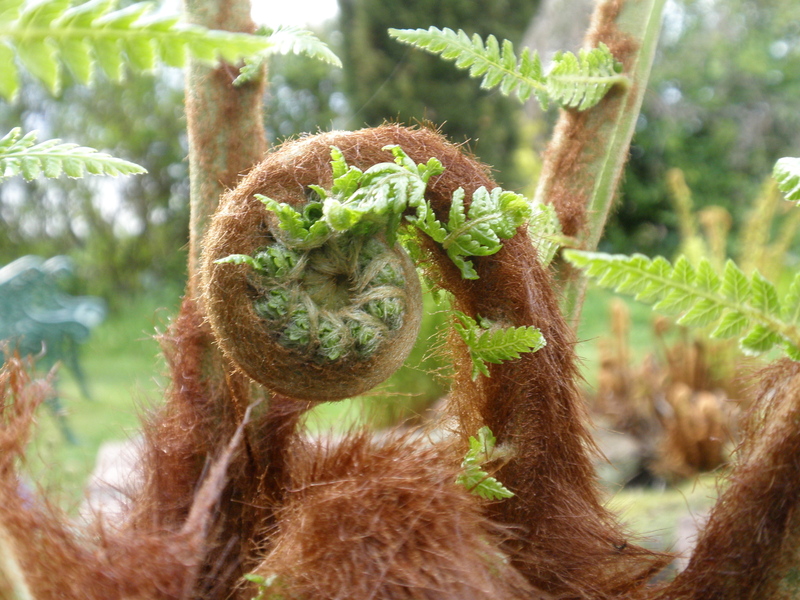 There are several reasons for this: because the tree fern needs to be watered so much over the first few months, the potting mixture inevitable become very wet and a smaller pot has a better chance to dry out a little between waterings; the unrooted log if very difficult to secure in a large pot unless it is planted unacceptably deep; smaller plants are easier to move around and more economical on potting mixture. After one full year in a small pot – the next spring – the tree fern produced roots that will apear out of the drainage holes. When this happens it is time to pot it on. 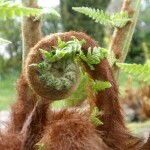 Feed the tree ferns only after roots are fully developed. If it is fed too much nitrogen, there is a risk that a lot of foliage will be produced with little or no root, possibly stressing the plant if it is allowed to dry out at all. Feeding with a high potash and low nitrogen fertiliser to encourage root growth may be fine but not necessary.